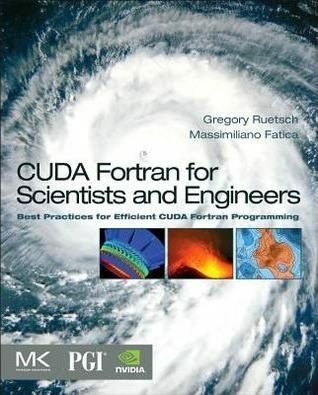 In the last CUDA Fortran post we dove in to 3D finite difference computations in CUDA Fortran, demonstrating how to implement the x derivative part of the computation. In this post, let’s continue by exploring how we can write efficient kernels for the y and z derivatives. As with the previous post, code for the examples in this post is available for download on Github. One way to recover perfect coalescing is to expand the number of pencils in the shared memory tile. For the C2050 this would require 32 pencils. Such a tile is shown on the right of the figure earlier in this section. Using such an approach would require a shared memory tile of 9216 bytes, which is not a problem. However, with a one-to-one mapping of threads to elements where the derivative is calculated, a thread block of 2048 threads would be required. The C2050 has a limits of 1024 threads per thread block and 1536 threads per multiprocessor. We can work around these limits by letting each thread calculate the derivative for multiple points. If we use a thread block of 32×8×1 and have each thread calculate the derivative at eight points, as opposed to a thread block of 4×64×1, and have each thread calculate the derivative at only one point, we launch a kernel with the same number of blocks and threads per block, but regain perfect coalescing. The following code accomplishes this. Here we set lPencils equal to 32. This code is similar to the above y derivative code except the variable j is a loop index rather than being calculated once. When we use a large amount of shared memory per thread block, we should check to see the effect of whether and by how much the shared memory use limits the number of threads that reside on a multiprocessor. Each thread block requires 9216 bytes of shared memory, and with a limit of 48 KB of shared memory per multiprocessor, this translates to a maximum of 5 thread blocks that can reside at one time on a multiprocessor. (Compiling with -Mcuda=ptxinfo indicates each thread uses 20 registers which will not limit the number of thread blocks per multiprocessor.) With a thread block of 32×8 threads, the number of threads that can reside on a multiprocessor for this kernel is 1280 versus a maximum of 1536 on the C2050. The occupancy is 1280/1536 or 0.83, which is not a problem in general, especially since we are using eight-fold instruction-level parallelism via the loops over j. Here are the results for this kernel. This surpasses the bandwidth of the x derivative kernel. You might wonder if using such a larger number of pencils in the shared memory tile will improve performance of the x derivative code presented earlier. This ends up not being the case.